Tiny houses for homeless women were built mostly by other women. The worst part was the constant feeling of shame. It clung to Kuneshia “Kiesha” Casey no matter where she went, all alone in an itinerant world of squatting on the streets of Seattle. After being consumed by addiction, she had lost her home, her 8-year-old son and her dignity. In June 2018, 10 months after she enrolled in a faith-based program and finally began to get her life back, Casey was back in the same neighborhood where she had reached one of her lowest points -- sleeping behind a Jack in the Box fast food restaurant and using its dumpster as a toilet. But this time, she was not alone and not ashamed. She was with a group of other women, laughing and joking together as they set up walls, hammered in nails, framed doorways and painted houses for the city’s unique “Women4Women” project. 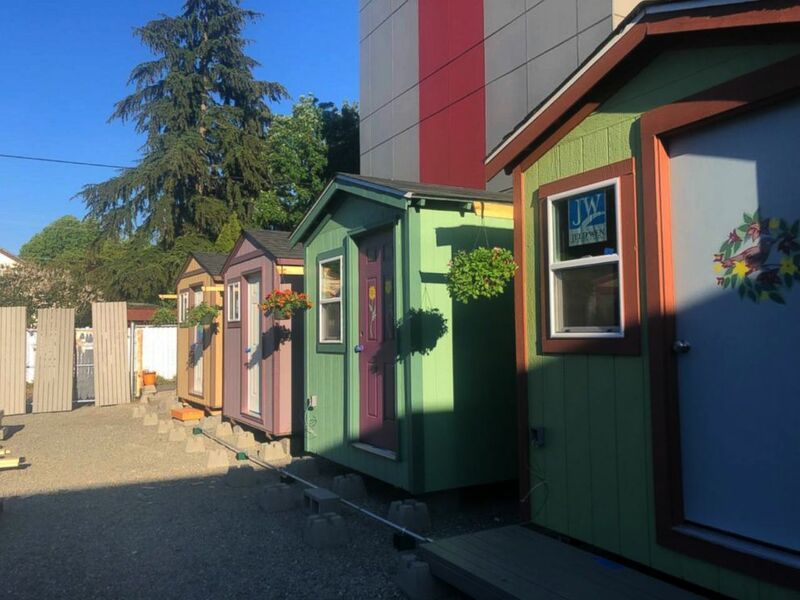 (Women4Women Tiny Houses) The Women 4 Women project constructed a tiny house village to fight Seattle's rising homelessness problem. The houses are exclusively for homeless women, and were built mostly by women. 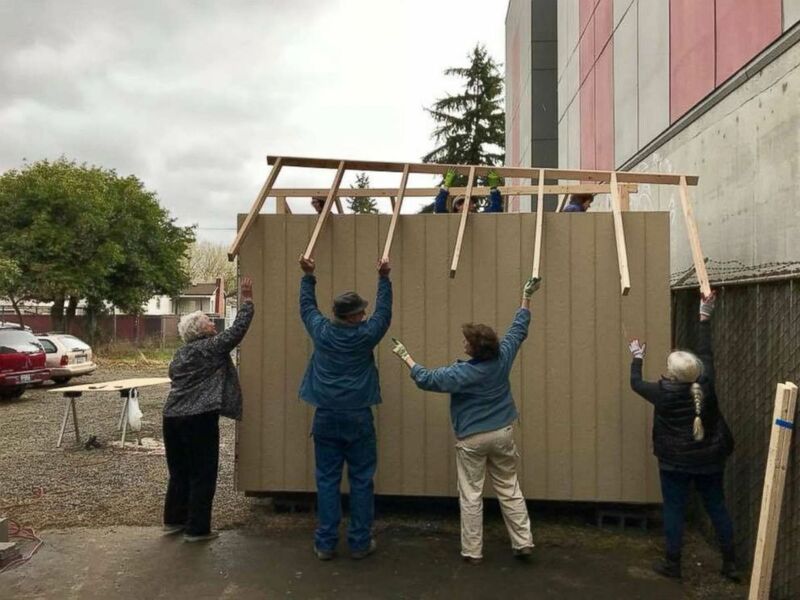 The project, run by the Low Income Housing Institute (LIHI), was to construct a "tiny house" village, one of many similar villages developed to fight Seattle’s rising homelessness problem -- but with a twist. In this village, the houses were exclusively for homeless women, and were built mostly by women. "At first I was like, 'no I'm not going back there. It's a trigger,'” Casey said. “That was the same place I became homeless, and where I began to abuse substances,” she said. “But I felt like this is something I have to do because I stayed in one of those tiny homes projects before and I know how good it felt to me when I had nowhere else to go, when I was sleeping on the ground. So I decided to join the Women4Women project." We loved the idea of the women coming here and getting tucked in, the idea that our sisters know that they're beautiful and cared for. Casey even brought her son Juju to join in the project, a few weeks after she was once again granted custody of him. In the tiny homes village, which opened last week, each house has about 96 square feet of space and is built to last about eight years, said Melinda Nichols, a longtime LIHI board member and one of the women who spearheaded the project. “This is an emergency response because we're desperate,” Nichols said. “We've got 12,000 homeless people in Seattle King County and we lose almost 200 of them a year. It gives me a sense of urgency that every house that we can put together and put someone in is going to help them have a better life. (Women4Women Tiny Houses) A tiny home is built by the Women 4 Women organization to fight Seattle's rising homelessness problem. That’s a fear Casey remembers vividly. One night, as she slept at her usual spot behind the Jack in the Box outlet, she awoke to the sound of a man walking up to her in the dark. Terror kept her frozen until she felt her bag, nestled in between her legs, moving softly from underneath her. That’s when she jumped up. She was afraid she would be attacked but even more afraid that her only possessions -- a toothbrush, toothpaste and a washcloth -- would be taken from her. Somehow she managed to drive the man away -- but the fear remained. Studies have found that homeless women face a disproportionately high degree of violence and sexual assault, even at shelters. They are often fleeing domestic violence and are more likely to have been victims of sexual abuse in the past, which makes them particularly vulnerable to mental health issues. They also face unique problems, such as not having access to feminine hygiene products or a clean place to change them. These are some needs that the tiny house village tries to fulfil for its residents, said Josh Castle, Community Engagement and Advocacy Director of the LIHI. The village is equipped with communal restrooms with feminine hygiene products. The area is fenced, has only one point of entry past a security guard and its perimeter is constantly patrolled. 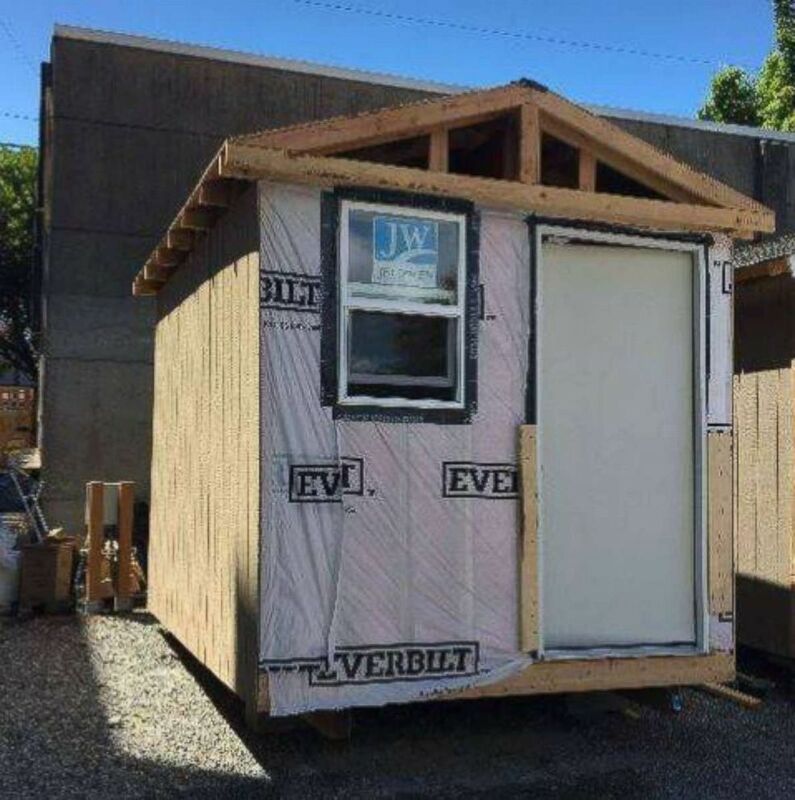 (Women4Women Tiny Houses) A tiny home built by the Women 4 Women project, which has constructed a tiny house village to fight Seattle's rising homelessness problem. The houses are exclusively for homeless women, and were built mostly by women. And what may go further in helping the residents of the village, said Casey, is having a community of women with similar troubles who can provide much-needed mental and emotional support. “A lot of the women you hear screaming and shouting on the street, you think they're crazy,” she said. “They're not crazy. Many of the women experiencing homelessness don't understand the position we're in, don't know how to clean up our act, because we don't know how to ask for help. But the Women4Women project’s goal goes beyond helping women who are experiencing homelessness, said Alice Lockridge, one of the leaders of the project. It also empowers an oft-overlooked community -- that of tradeswomen. Before joining the project, Lockridge had served for 30 years as a physical education teacher who helped women get physically demanding jobs, survive them and be successful at them. She said that in the male-dominated trades industry, these women are often undervalued and seen as impositions. So she set up a Facebook page at the end of March and sent out requests to tradeswomen whom she had taught for 30 years, and soon enough, a steady stream of volunteers began to arrive at the build site every weekend: former students and their friends and friends of their friends, electricians and plumbers and carpenters and women with no trades skills at all, eager to build houses for other women who had never gotten the opportunities they did. Melinda Nichols, who aside from being an LIHI board member was also a carpenter for 45 years and had supervised several other tiny house sites, said the atmosphere at this site was unlike any other she’d ever been on. Nichols said enthusiasm for the project grew quickly. Shannon Noel, a veteran painting contractor who has become the site’s ‘paint master,’ said she bought and mixed the colors and taught everyone on the site to use them. “It really was quite like the world you’d want it to be,” Noel said. And for her too, the energy and the devotion the volunteers brought to their work felt different. “There was a nurturing motherliness about us all, even among those who weren’t mothers,” she said. “It was as if these were our children who had gone astray somewhere and were struggling to stay afloat, and we were working to give them some rest." Last week, about three and a half months after work on the site began, the row of pretty little houses was finally ready, with welcome mats laid out, the interiors decorated, the beds made. There were unique little touches that the female workers had left: pots of blooming flowers hanging from every porch and hand-made artwork on the doors of the houses. Their labor of love was complete.